Anyone know if a distributor with a 5" diameter cap will fit? Some people say yes, some say no. There's a recent thread that touches on this subject. The big cap is both 1" larger in diameter and 5/8 inch taller, but its still shorter than an MSD #8477 distributor. A whole bunch of people use the 8477.
which one is which in the picture please? on the left the Ford Duraspark distributor with the 5" two piece Duraspark cap. 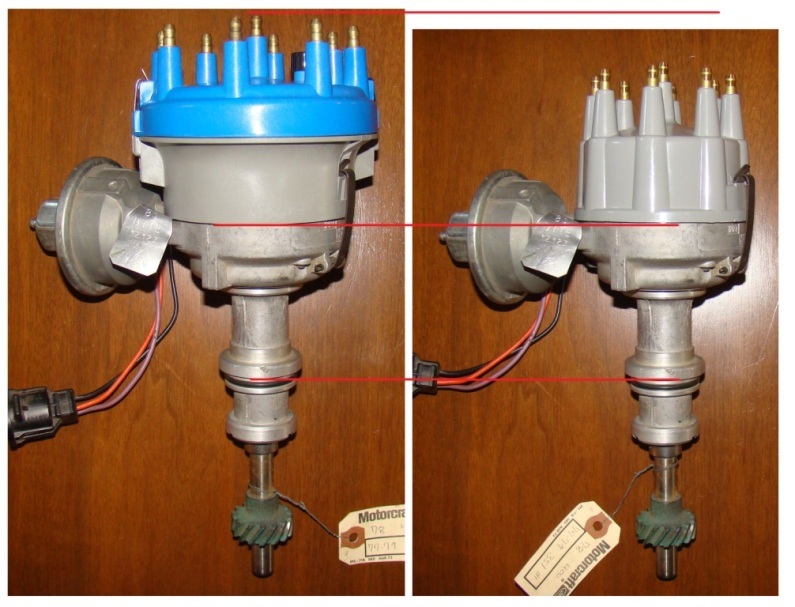 on the right is the same distributor with a smaller 4" "International Harvester" cap (having the same male wiring terminals). an MSD distributor is not pictured. Danke George..we/I miss a lot of skill in the old world..